It has been 100 years since the Natone, or Wyatt Earp first set sail, and exactly 60 years since her demise on Rainbow Beach…. The pictures attached to this article show remains from the Ulverstone Shipping Company tramp costal vessel Natone which ran aground during a fierce cyclone at Rainbow Beach on January 23-24, 1959. Although known as Natone at the time of her death, she only used this name for the last three of her 40 years. 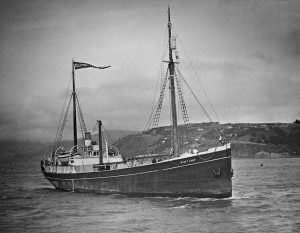 Originally christened as the Fanefjord this 41.3-metre-long vessel left her Norwegian ship-building yard in 1919 to commence work in the Norwegian herring fishing trade. She was built with very heavy timbers, so she could withstand arctic ice if encountered. In 1933 she was purchased by American explorer Lincoln Ellsworth, who renamed her Wyatt Earp after the marshal of Dodge City and Tombstone Arizona. Wyatt Earp was a tough Marshal and Ellsworth hoped this vessel would be equally tough. He took her to Antarctica four times between 1933 and 1939. During WWII she was acquired by the Royal Australian Navy who chose to rename her HMAS Wongala, an aboriginal word for a boomerang. She was paid off after the war but in 1947 was reacquired by the Navy for new Antarctic exploration and reverted to the old name as HMAS Wyatt Earp. Paid off again by the Navy in 1948 she reverted to her costal tramp duties as the MV Wongala. In 1956 she was purchased by the Tasmanian-based Ulverstone Shipping Company who named her Natone, after the Tasmanian potato growing town near Ulverstone. Natone was bound for Brisbane after an uneventful cruise from Cairns when she struck severe weather north of Double Island Point. She sprang a leak and headed for cover using her sails after the engine room flooded but, alas, ran aground on the Mudlo rocks. Although she had been built to withstand ice, she was no match for the pounding surf and broke up after a few days. There are several pieces of Natone’s hull still scattered along the beach. They only become visible after severe erosion when the sand levels return to those that were present in January 1959. The attached photos were taken after severe erosion in January 2008. I don’t believe the bones of Natone or HMAS Wyatt Earp, as I prefer to call her, have emerged again since then.